Local investors looking for the much-delayed "Santa rally" had a bit to cheer about yesterday, although other regional markets were muted as risk appetites took a hit from lacklustre economic data out of China last Friday. Stocks in Shanghai, Tokyo and Seoul gained marginally while Hong Kong ended the day flat. 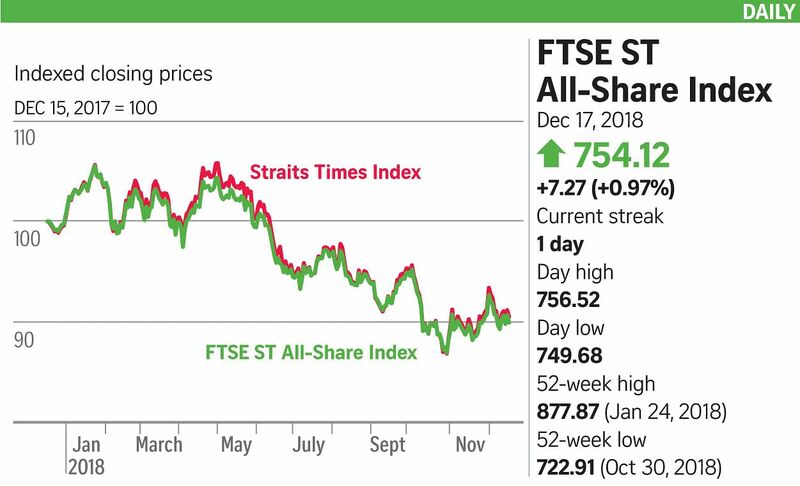 Singapore's benchmark Straits Times Index put in a better showing, ahead 1.4 per cent at midday before ending 1.2 per cent up at 3,114.25 on trade of 985.3 million shares worth $810.6 million. Gains were led by all three local banks. United Overseas Bank was the standout, jumping 2.64 per cent to $24.92, while OCBC added 1.97 per cent to $11.34. DBS was the laggard, adding 1 per cent to $23.94. Most analysts have been highlighting the banking sector among their top picks for next year, with net interest margins expected to grow. The gains also suggested that investors looked past yesterday's data, which showed a worse-than-expected fall in Singapore's non-oil domestic exports (Nodx) last month. Shipments to most of its major trading partners declined. Nodx fell 2.6 per cent last month from a high base a year ago, and after an 8.2 per cent spurt in October, according to trade promotion agency Enterprise Singapore. But local investors may only see more gloom, as industry watchers believe the weak Nodx could weigh on output growth. ING chief economist Robert Carnell said: "Although the month-on-month correlation with Nodx is not terribly good, it's not zero, and this raises the chances of soft November production, which, in turn, would make it hard for (fourth-quarter) gross domestic product to finish on a strong note." Yet, the weakness lingering in markets may prove an opportunity for bargain hunters around the region, according to some observers. "Buy-back was seen among shares in major companies, following a sharp decline on Friday," Daiwa Securities senior technical analyst Hikaru Sato told Agence France-Presse in Japan. However, he noted that more time may be needed to improve sentiment as the buy-back was not strong enough to boost shares. Mr Khiem Do, head of Greater China investments at Barings, said: "Over the next few months, if there were to be any more weakness in the Chinese market, we think that there will be more investors coming in to buy. "The Chinese markets are actually quite cheap."